At last, a good excuse! Mother's got a brand new ... bar! I'm a Trek fanboy, but the '08 Madone? Should bike shops have womens sections? What does it mean to support racing? For a few years now I've been an advocate of wearing keirin gloves when sprinting. These gloves are a bit more robust than normal roady gloves. They're full finger, all leather and some come with knuckle guards as well. They're more like a lightweight motorcycle glove than a road cyclists glove and for good reason. Crashes are commonplace during sprint events, much more so than road races, and often at high speeds too. I've crash-tested a few and was pretty glad to have them on. 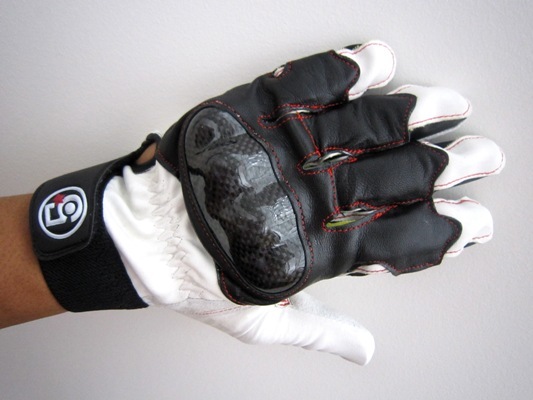 Many track sprinters use golf gloves but they're not ideal, a glove designed for sprinting is probably a better option. My first pair of these gloves was a pair sold by Tuff, they're good, solid gloves with a carbon fiber knuckle guard but they have a thick leather palm, which is fine on a motorbike but does take a little feel away and a few sprinters I know were a bit put off by the palm thickness. Along came Gary Jackson from Riviera Cycles and he has his own range, very similar to the Tuff gloves (which are discontinued) and they filled the void nicely for a year or so. Also, they're excellent value. Japanese Keirin gloves, when available retail for well over $100 in Australia, and the Jack-O (Gary Jackson) gloves are half that ($45 at time of writing). Top value indeed. But, still with a heavy palm and a neoprene wrist band that is a bit fragile. Enter Josiah Ng. Josiah's an elite track sprinter in the Malaysian squad who train in Melbourne with John Beasley. Josiah is a bit of a gear freak and loves fancy stuff, but he's also got an eye for a good price. He wanted something better than the Jack-O, but something that wasn't stupidly expensive. Josiah has a glove that fills the void between the excellent value Jack-O and the Japanese gloves. He's called it the Keirinjo. I bought a pair of these a couple of weeks ago and got my first chance to use them at the Victorian Masters track championships last weekend. First thoughts are that they're very supple. The palm is a much softer leather than the Tuff or the Jack-O, which was my main issue with those two gloves. The wrist strap arrangement I found cumbersome though, it was awkward to get snug, so the gloves are not perfect, but they felt great once on and I felt a much better connection to my bars than I did with the other gloves, more grip from the leather. I was in the habit of spitting on my Jack-O gloves to get them to stick, but there was no need for saliva to get a firm handle on my EC90's with the Keirinjo's. In terms of protection, I haven't crash tested them and I don't want to, but they seem as robust, if not more so, than the other pairs. They're more expensive, Josiah's selling them through his brand 5bling, for $88 AUD. Do I think they're worth the extra bucks? Yes. The feel of them is superior and although they cost a bit more I think it's worth it. I'll be using these gloves a lot over the next 12 months and if they last well and keep their suppleness, I'll get another when they're worn out. Check 'em out, they're good stuff and meet the aboc "I use 'em myself" criteria. In the interests of full disclosure, I have to point out that both Josiah and Gary are friends of mine, but in both cases I paid full retail price for both pairs and I receive no kickbacks or credits etc from either.